Library Members! How to Get Your Discount! If you're new to the AutoHotkey Library you can purchase the Motley Plus Mega Library Bundle which includes all nine of Jack's other AutoHotkey books, plus, Jack's Motley Assortment of AutoHotkey Tips. If you're a current AutoHotkey Library owner, contact us with the Contact Form at Jack's AutoHotkey Blog with your invoice number and/or e-mail address. We will send you a special one-time use discount code for the Jack's Motley Assortment of AutoHotkey Tips Bundle (all three formats). Add the bundle to your shopping cart and use the code at check out to receive your discount. If, in the past, you've purchased any other AutoHotkey books from ComputorEdge E-Books and would like to upgrade to a current AutoHotkey Library Bundle, use the Contact Form at Jack's AutoHotkey Blog with your invoice number(s) and/or e-mail address. We will calculate the value of your previous purchases and send you a one-time discount code toward the purchase of an appropriate bundle. That includes bundle upgrades. Note: If you bought this book at ComputorEdge E-Books and need additional downloads for the latest version, contact us through the Jack's AutoHotkey Blog contact form. Please supply the invoice number, although, we can look up your purchase based upon your e-mail address. 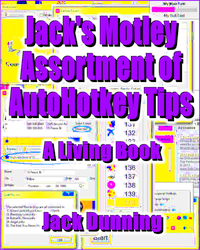 To determine if you have the most recent version of Jack's Motley Assortment of AutoHotkey Tips, you can check the date of publication, the edition number, or the chapter number within the book. Whenever I release a new version, I will change the first two at the ComputorEdge E-Books site. Within the book, I plan to use new numbers for new chapters. For example, in the first edition every chapter uses the digit 1 as the second part of the number (e.g. "3.1.4 Blocking Mouse Action"). When I add chapters to the next edition, I plan to use the digit 2 as the second part of the number (e.g. "3.2.6 Special Mouse Considerations"). This number system will make it easier to identify additional content in new versions of the book. We convert the tip for finding next Friday's date into a function for inserting the date of any upcoming weekday. Learn how to use the same line drawing code over and over again by putting it in an AutoHotkey function—then draw a line anywhere in Windows Paint of any length at any angle using only one line of code. When Too Many Identical Chapter Numbers Appear in the E-Book Index, It’s Time for Another AutoHotkey RegEx, Plus, How to Use a Backreference! Are Regular Expressions Worth the Effort and Learning Curve? When you find that you are adding so many data and editing fields to your AutoHotkey GUI windows that they turn into large, grotesque forms, then discover the Tab GUI control. Tabs instantly add more space to your apps without needing more screen. Every So Often You Slap Yourself on the Side of the Head When You Realized How Simple You Can Make It! Both Hotkey Modifiers and Special Characters Might Disappear When Used in Regular Text. Usually, You’ll Find the Raw Mode the Easiest Solution for Vanishing Characters. Use These AutoHotkey MsgBox Tricks for Adding Power and Flexibility to Your Scripts. If You Want a Simple, Quick Way to Display Data and Execute Action, You’ll Love These Techniques! Who Doesn't Want to Read Faster? While it's great to build pop-up windows with the AutoHotkey GUI command, writing all that code gets tedious. Use SmartGUI Creator to quickly generate lines for your scripts. Save time by quickly cloning the code from any active AutoHotkey window, plus, more useful SmartGUI Creator techniques. I broke many of the lines of code in the book into two or more parts. As much as possible, I used line continuation techniques to break the lines. This allows you to copy the code and directly run it without alteration. However, at times, I could not break the lines in a way which would not interfere with its operation. In particular, the chapter on "God Mode" requires you to unwrap certain lines to before you run them. This book contains numerous Web links to external resources (especially the AutoHotkey online documentation). These require an active Internet connection. You'll find a limited number of references to the coming AutoHotkey Version 2.0. As the book grows, many more will appear. That does not a comprise a recommendation about either AutoHotkey V1.1 or V2.0, but merely an observation about the changing nature of AutoHotkey. For more information and my opinion about AutoHotkey V2.0 see the blog "AutoHotkey Version 2.0—Should I Wait for It?" The free book AutoHotkey Tricks You Ought to Do with Windows includes the "Table of Contents" and "Indexes" for all of my AutoHotkey books. You can download it free at the "Free AutoHotkey Book!" site. Plus, you'll find the book included in all major library bundles available at ComputorEdge E-Books.